Can someone please point to the exact part of the firearms act that prohibits the discharge of restricted weapons on your own property assuming of course that the said property is rural, your residence and that discharge of firearms is done safely. Technically it's not illegal, the CFO just refuses to issue you an authorization to do so. 15. An individual may load a firearm or handle a loaded firearm only in a place where the firearm may be discharged in accordance with all applicable Acts of Parliament and of the legislature of a province, regulations made under such Acts, and municipal by-laws. 17. Subject to sections 19 and 20, a prohibited firearm or restricted firearm, the holder of the registration certificate for which is an individual, may be possessed only at the dwelling-house of the individual, as recorded in the Canadian Firearms Registry, or at a place authorized by a chief firearms officer. Upset a Lefty, Fly a Drone! The CFOs seem to interpret the rules as they please, and here is the interpretation that they seem to be using. To be authorized to have restricted firearms for target shooting purposes, an individual must provide proof that he or she practices or competes at an approved shooting club or range. For more information about approved shooting clubs and ranges, contact the appropriate provincial or territorial CFO by calling 1-800-731‑4000. So in order to target shoot on your own property, you would need to have it approved for restricted weapons, and getting your property approved as a restricted range, won't be easy to do. but that is my point. rurally your att is good from your land location not dwelling so carrying it around property should be covered by att. in town tec speaking you are breaking the law carring you pistol to your detached garage to clean it without a statt. I recently looked into upgrading my PAL to restricted and was stunned when told I couldn't shoot my handgun (when I finally got one) on my property it had to be at a range/gun club. What is the difference to taking my rifles out back and tearing up some paper with them or doing the same with a hand gun? How in the name of ........ does this make sense? I have a restricted license and the only time I get a gun range membership is in the year that I have to renew my PAL because they require a membership in order to renew a restricted. After the first year expires I just leave it and shoot on my place all the time. The only way police or F&W would know if I was shooting on my place is if I called them to report it. I think if you have a big enough place to shoot and everything is clear then frankly it's none of their business what you do with a gun on your own property. I know that's probably illegal what I'm doing but I don't plan on reporting myself. It has been scientifically proven that a 308 round will not leave your property -- they essentially fall dead at the fence line. But a 38 round, when fired from a handgun, will of its own accord leave your property and destroy any small schools nearby. I tend to agree with you. It caught me off guard though. It just didn't make any sense - if it's ok to shoot the rifles with a longer effective range why not a hand gun? Because handguns are scary to the sheeepeople . What you're doing isn't probably illegal, it's completely illegal. Like you said, as long as you don't get caught, but you do risk losing all of your firearms, forever. I know some guys do this kind of target shooting all of the time though. A small derail but I've got a question. I have my non restricted and restricted PAL, when asked why I wanted restricted, I said for target shooting. Over the years I've accumulatd rifles and shottys but no hand guns. Now my license is up for renewal and I still don't own a restricted firearm nor do I have any membership to a club. Is it a MUST that I apply for a membership to a gun club before they'll allow my renewal? Even though I don't yet own a restricted gun? What do you guys think? As far as I know, you only need a club membership to obtain / renew your transport permit. You don't need a club membership to have an RPAL. No you don't need a membership to renew an RPAL, according to the law. The CFO may have arbitrarily created a new rule though. Time to get rid of these empire building pieces of snake feces. I know my english "aint no good" but the way I read that statement is that to own the handgun you have to belong to the range. It doesn't say anything about shooting said gun anywhere (e.g. in your back 40). ergo - if you belong to a club then you can shoot in the field. "Life's journey is not to arrive at the grave safely in a well preserved body, but rather to skid in sideways, totally worn out, shouting WOW...what a Ride"!! Ok what part of the firearms act declares this ? I don't see a clear cut statement saying its illegal but I wouldn't want to be the test case either. I don't have a copy of the firearms act, but I do know that you're only able to legally discharge a restricted firearm at an approved range. If it was legal, you'd hear more people discussing shooting their handguns / ARs on their farms, etc. While I'm sure that happens, it doesn't happen legally. Still, when in doubt, get your info from the horse's mouth, not from an internet chat board. Call the CFO.... you wouldn't want to pony up your life's saving to hire a lawyer just because you went out target shooting on your own property thinking it was OK to do so. True. But the CFO is interpreting the act quite possibly incorrectly. Their (CFO) discretionary power is far to great. Creating rules that aren't backed up by legislation is plain wrong. But then again I'm sure not wanting to be the test case. i would shoot on my property and i wouldnt think twice about it. Find all posts by jaylow? X2, I've yet to meet a land owner that doesn't shoot his pistol on his own land. If all you own is 5 acres along HWY 2 then you might not want to. Unless you are commiting a real crime the local RCMP have better things to do. If you have a history of criminal activety that would be different. If your a worry wart type that's scared of your own shadow then don't do it. What ever anyone's opinion is on this topic, it's probably not a good idea to tell someone to break a law where if by chance the authorities know about it, the consequences could be severe. It's not legal, judge the risk, and decide if the chance is worth it. 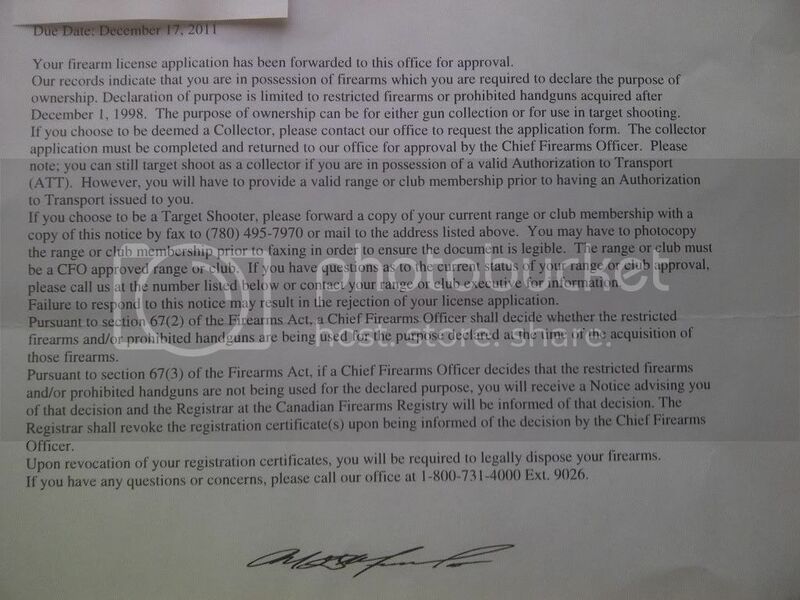 NOTICE WHERE IT SAYS..."Failure to respond to this notice may result in the rejection of your license application"
Have a read.....basically they are saying I NEED to have a range membership....this is what I got from the letter, correct me if I am wrong. First. I would like go see some a case where someone was charged for shooting restricted on there property................ That's because it has not happened. Second the law does not clearly say you can not shoot restricted on your own property it is a interpretation of the law. I have talked to many RCMP as well police officers and each and every one said you can shoot what you want on your own property or they did not know. Fact is everyone on here listens to everyone else without even picking up the phone and asking the CFO himself. After reading this I am going to call them in the morning. Apparently the CFO has a letter out saying you are allowed to shoot restricted on your own property as long as it is being done in a safe manner. Apparently the CFO has a letter out saying you are allowed to shoot restricted on your own property as long as it is being done in a safe manner. If such a letter does actually exist, please provide a link, or a copy showing it to be genuine, as many people would like to see it. Again I point out the the laws quoted most often are for possession and transportation of the firearm NOT shooting it. If you are a member of a range then you have the authority to own the firearm. If you don't have to go off your property then you are not transporting it. Having said that, you may be able to win a legal action after several thousands of dollars in legal fees. Not my style. Again, please show me the exact legislation that makes this illegle.